The 37th-ranked Stanford men had their winning streak stopped at five matches, losing 6-1 to No. 1 USC in Los Angeles on Friday. The Cardinal (6-3) won the doubles point against the Trojans (10-1), who have won five of the last six NCAA team titles. At No. 1 doubles, Stanford's John Morrissey and Robert Stineman toppled second-ranked Yannick Hanfmann and Roberto Quiroz 6-3. Hanfmann and Quiroz rebounded in singles, though. Hanfmann, ranked sixth, defeated No. 26 Tom Fawcett 6-4, 6-4 on Court 1. No. 20 Quiroz won the clincher, beating Morrissey by the same score on Court 2. Sacramento State def. Weber State 4-3 in Sacramento. No. 1 singles (clinching match): Sean Kolar def. Jakub Gewart 7-6 (5), 7-6 (4). Notes: The Hornets were missing two of their top players, injured Marek Marksoo and Niranjan Ram. The Wildcats went 10-0 in the Big Sky Conference during the 2014 regular season. Records: Sacramento State 3-4 overall, 1-0 Big Sky; Weber State 4-8, 0-1. Sacramento State def. No. 46 Long Beach State 4-3 in Sacramento. No. 1 singles: No. 93 Maeva Razakasoa (LBSU) def. Alina Soltanici 6-4, 6-1. No. 2 singles (clinching match): Anna-Maria Nau def. Ebba Uden 6-3, 4-6, 6-4. Records: Sacramento State 5-5; Long Beach State 6-1. Book review: "Locker Room Power"
Many, if not all, matches are won or lost before a player steps on the court. That's the underlying theme of "Locker Room Power: Building an Athlete's Mind" (2014) by David Sammel of Great Britain. Locker Room Power, Sammel writes, is desire + weapons + belief + results. Essentially, it's an aura of superiority. To develop an aura, Sammel says players must build their game around weapons, which create confidence, and work on weaknesses only if they undermine the ability to use weapons. The 106-page paperback is easy to read. It's clearly written and divided into 27 chapters, each summarized by key points at the end. The book contains many good tips, such as "To succeed, you will have to take risks, and with risk comes some failure." It also features numerous inspirational quotes from such diverse figures as ancient Greek poet Aeschylus, Winston Churchill, Ralph Waldo Emerson, Muhammad Ali, Andre Agassi, John Wooden and Dan Marino. --"The fight is won or lost far away from witnesses -- in the mind, behind the lines, in the gym, and out there on the road, long before I dance under those lights." --"I told the world I was the greatest. I figured if I told them often enough, eventually they would believe me." high No. 11 to No. 14 in doubles. Raquel Kops-Jones of San Jose slipped from a career-high No. 11 in doubles to No. 14 after losing in the first round at Dubai with Abigail Spears last week. Seeded fifth, Kops-Jones and Spears fell to Germans Julia Goerges and Anna-Lena Groenefeld 7-6 (1), 6-2. It was the first tournament for Kops-Jones, 32, and Spears since they reached the quarterfinals of the Australian Open. They also advanced to the final in Sydney last month, losing to Bethanie Mattek-Sands of Phoenix and Sania Mirza of India. Kops-Jones and Spears gained the Dubai final last year, falling to Alla Kudryavtseva of Russia and Anastasia Rodionova of Australia 6-2, 5-7 [10-8]. Kops-Jones won the 2003 NCAA doubles crown with Cal teammate Christina Fusano, a Sacramento native who climbed to a career-high No. 84 in doubles in 2008 and retired in 2011. Collin Altamirano, 19-year-old Sacramentan -- No. 744 in singles (+5), No. 885 in doubles (+1). Bradley Klahn, 24-year-old former Stanford star -- No. 204 in singles (no change), No. 153 in doubles (-15). Mackenzie McDonald, 19-year-old Piedmont resident -- No. 625 in singles (+6), No. 557 in doubles (+2). Dennis Novikov, 21-year-old San Jose resident -- Career-high No. 253 in singles (+18), career-high No. 293 in doubles (no change). Sam Querrey, 27-year-old San Francisco native and former Sacramento Capital in World TeamTennis (2012-13) -- No. 40 in singles (-1), No. 64 in doubles (no change). Matt Seeberger, 30-year-old Los Altos resident -- No. 395 in doubles (-1). Dmitry Tursunov, 32-year-old resident of Folsom in Sacramento area -- No. 140 in singles (no change), No. 245 in doubles (-4). Kristie Ahn, 22-year-old former Stanford star -- No. 539 in singles (+3), No. 606 in doubles (+2). CiCi Bellis, 15-year-old resident of Atherton in San Francisco Bay Area -- No. 247 in singles (-3), No. 977 in doubles (-160). Alexandra Facey, 22-year-old resident of Cameron Park in Sacramento area -- No. 728 in doubles (-1). Kat Facey, 22-year-old resident of Cameron Park in Sacramento area -- No. 728 in doubles (-1). Nicole Gibbs, 21-year-old former Stanford star -- Career-high No. 86 in singles (no change), No. 1,000 in doubles (-4). Michaela Gordon, 15-year-old resident of Saratoga in San Francisco Bay Area -- No. 759 in singles (-76). Lejla Hodzic, 29-year-old former Stanford standout -- No. 744 in doubles (no change). Raquel Kops-Jones, 32-year-old San Jose resident and former Cal star -- No. 14 in doubles (-3), No. 788 in singles (+21). Maria Sanchez, 25-year-old Modesto product -- No. 108 in doubles (-2), No. 229 in singles (-5). Karina Vyrlan, 16-year-old Sacramentan -- No. 951 in singles (+3). Allie Will, 23-year-old native of San Mateo in San Francisco Bay Area -- No. 178 in doubles (-4), No. 564 in singles (+5). Carol Zhao, 19-year-old Stanford sophomore -- No. 288 in singles (+1), No. 514 in doubles (-3). Dubai (men), quarterfinals, 3-4:30 a.m. (live) and 5-6:30 p.m. (repeat). Dubai (men), Doha (women), quarterfinals, 4:30 a.m.-11:30 a.m. (live). Acapulco (men), quarterfinals, 1-5 p.m. and 6:30-10:30 p.m. (live). Dubai (men), Doha (women), semifinals, 5-9:30 a.m. (live). Dubai (men), semifinals, 10 a.m.-2 p.m. and 6-8 p.m. (repeat). Doha (women), semifinals, 2-4 p.m. (repeat). Acapulco (men), semifinals, 4-6 p.m. and 8-10 p.m. (live). Dubai (men), Doha (women), Buenos Aires (men), semifinals/finals, 7 a.m.-noon (live). Dubai (men), final, noon-2:30 p.m. and 5-7 p.m. (repeat). Doha (women), final, 2:30-5 p.m. (repeat). Acapulco (men), final, 7-9 p.m. (live). Dubai (men), final, 5-7 a.m. (repeat). Doha (women), final, 7-9 a.m. and 7-9 p.m. (repeat). Buenos Aires (men), final, 9-11 a.m. (live) and 5-7 p.m. (repeat). Acapulco (men), final, 11 a.m.-1 p.m. (repeat). Cal's Maegan Manasse slipped to No. 2 behind Virginia's Julia Elbaba in this week's college rankings, released today. Manasse, a sophomore from Redondo Beach in the Los Angeles area, went 1-1 in deciding matches against rivals USC and UCLA last weekend. Manasse lost to No. 22 Giuliana Olmos of USC 2-6, 6-2, 6-3 in Cal's 4-3 loss and beat No. 9 Chanelle Van Nguyen 3-6, 7-5, 6-1 in the Bears' 4-3 victory over defending NCAA champion UCLA. Both matches were in Berkeley, near Olmos' home in Fremont. Cal led 3-0 against USC. UCLA was missing two of its top players, Robin Anderson and Jennifer Brady, in singles because of injury. Anderson won at No. 2 doubles. The idle USC men, with sophomore Connor Farren of Foster City in the San Francisco Bay Area, replaced Oklahoma at No. 1 after the Sooners lost at No. 13 Texas A&M 4-3 and beat No. 8 North Carolina 4-1 in Norman, Okla.
Sacramento State's Alina Soltanici, a sophomore from Moldova, was named the Big Sky Conference women's Player of the Week after beating No. 80 Elianne Douglas-Miron of Washington 1-6, 6-3 [10-8] and Portland State's Dane Vorster 6-2, 6-2 at No. 1 singles. It was Soltanici's first career win over a ranked opponent. Daryl Lee, the former men's coach at UC Davis, is now an assistant coach for the Sac State women. Mike, right, played for the San Diego Aviators last season. It didn't take long for the Sacramento area to return to World TeamTennis. After a one-year absence, a WTT team again will play in a temporary stadium in the parking lot at Sunrise Mall in Citrus Heights this summer. A new ownership group is moving the Texas Wild from the Dallas suburb of Irving to Sacramento, WTT announced Monday. The Wild lasted only two years after relocating from Kansas City, where the Explorers played for 20 years. Sacramento's team, formerly the Capitals, will be known as the California Dream. WTT's 40th season will begin July 12 and end on Aug. 2 with the WTT Finals. Joining longtime Kansas City/Texas owner Jeff Launius in the new group are Bob Kaliski, the president of the Harbor Point Tennis Club in Mill Valley (across the Golden Gate Bridge from San Francisco), and Michael Malone, a Dallas-based investment banker. Launius said the sponsorship of Sunrise MarketPlace for an undisclosed amount and the fans' passion appealed to the Dream's owners. "For so many years, I hated bringing my team to Sacramento because I knew there would be so many fans there going crazy for their team," Launius said in a statement. "I hope they feel the same way about the Dream and come out to support us. This market certainly has fans that know and love World TeamTennis and they deserve a team." The franchise is going from the fourth-biggest metropolitan area in the country (6.8 million population) to the 27th (2.2 million). But instead of being a proverbial small fish in a big pond, it will be more the reverse. WTT also has left the New York and Los Angeles areas in recent years, although it retains franchises in Philadelphia, Washington and Boston. Those three teams comprise the Eastern Conference. Washington has won the last four WTT titles and five of the last six. Residing in the Western Conference, along with California, are San Diego, Springfield (Mo.) and Austin, Texas. This will be Springfield's 20th year in the league and the second for San Diego and Austin. When asked for the Wild's average attendance last season, Launius said in an interview, "Golly, I'd have to go back and look." Playing for Texas last year were Alex Bogomolov Jr. of Russia, Aisam Qureshi of Pakistan, Anabel Medina Garrigues of Spain and Darija Jurak of Croatia -- not exactly household names, especially in Texas. The Capitals, the longest-running and most decorated WTT franchise, announced last February that they were moving to Las Vegas after 28 years in Sacramento. The Capitals hold the record with six WTT championships, including four straight (1997-2000), but mostly struggled on and off the court since its last title in 2007. Sacramento reached the 2012 WTT Finals, losing to Washington 20-19 in Charleston, S.C., but slumped to 5-9, the worst record in team history, in 2013. They averaged 1,357 fans for their seven home matches that season, according to then-general manager Kolleen McNamee. McNamee cited the lack of a permanent tennis facility as the reason for the move. It cost $125,000 annually to build and dismantle the stadium, said former Capitals owner Lonnie Nielson. Four weeks after the Capitals' announcement, WTT disbanded the team when team owner Deepal Wannukuwatte was jailed on charges of defrauding investors in his medical supply business of $109 million. Wannakuwatte, 64, was sentenced in November to 20 years in prison. California's roster will be determined in the WTT draft on March 16 in Indian Wells. Possible members, in addition to last year's Texas players, are former Capitals Mark Knowles (43), Sam Querrey and Mardy Fish and Modesto product Maria Sanchez. California also must name a coach soon. Brent Haygarth, a South Africa native, coached Kansas City/Texas for the past seven years. Another logical choice would be Knowles, a 12-year WTT veteran (all with Sacramento) and three-time WTT Male MVP. Longtime Capitals coach Wayne Bryan, the 68-year-old father of doubles stars Bob and Mike Bryan, stepped down after the 2013 season to spend more time with his family. This year is looking a lot like the last one for Bob and Mike Bryan. For the second year in a row, the former Stanford All-Americans won Delray Beach for their first title of 2015 after losing in the third round of the Australian Open. The 36-year-old Bryan twins, playing near their adopted homes in Florida, edged Raven Klaasen of South Africa and Leander Paes of India 6-3, 3-6 [10-6] on Sunday for their fourth Delray Beach crown and 104th overall. The Bryans, who grew up in Camarillo in the Los Angeles area, have won a record 16 Grand Slam men's doubles titles. The 41-year-old Paes has captured eight. Klaasen, the baby of the Delray Beach doubles finalists at 32, seeks his first Grand Slam crown. He has reached one major final, last year's Australian Open with American Eric Butorac. In fact, they eliminated the Bryans. Dmitry Tursunov, sidelined for almost six months with plantar fasciitis in his left foot, remains out indefinitely. "I started hitting for a little bit in the middle of January, and it seems like I'm not in pain," the 32-year-old Russian, who trains in the Sacramento suburb of Granite Bay, wrote in an e-mail this week. "But there is quite a long road ahead just to get back into shape, so at the moment, there are no projected tournaments. I'm not sure if I'll get the pain back once the workload increases." With his usual sarcastic sense of humor, Tursunov added, "That's about all the excitement I have for you." Tursunov has played only one tournament since falling in the first round of Wimbledon last year to nemesis Denis Istomin. In the opening round of the U.S. Open, Tursunov lost to Alejandro Gonzalez of Colombia 6-4, 6-4, 7-5. Ranked No. 30 last July, the injury-prone Tursunov has tumbled to No. 140. His best year was 2006, when he reached a career-high No. 20 and helped Russia win its second and last Davis Cup title. The good news for Tursunov is that if and when he returns to competition, he will have few points to defend and the exotic car enthusiast has a lot of miles left on him because of repeated layoffs. Australian Nick Lindahl, the runner-up in the 2009 Aptos Challenger as a qualifier, has been charged with corrupt betting offenses. New South Wales police arrested Lindahl, 26, saying he intentionally lost a match in a 2013 Futures tournament in Toowoomba, Australia, the Associated Press reported. A betting agency detected unusual gambling patterns and notified police. Lindahl reached the Australian Open junior boys final in 2006, losing to Alexandre Sidorenko of France, and fell to countryman Chris Guccione in the 2009 Aptos final. Aptos is located near Santa Cruz in Northern California. Also in 2009 Challengers, Lindahl advanced to the semifinals in Tiburon (near San Francisco) as a qualifier and the quarterfinals in Sacramento. He attained a career-high ranking of No. 187 in 2010. Lindahl was released on bail and is scheduled to appear in court on March 12. He retired in December, according to the AP, but hasn't played in a professional tournament since September 2013. Only nine days ago, the Italian Tennis Federation suspended Potito Starace and Daniele Bracciali for 40 days while investigating them for possible match fixing. A prosecutor told the AP in November that Bracciali partially admitted to fixing during a hearing with investigators. Starace says he's innocent. The ATP World Tour suspended Bracciali, Starace and three other Italians -- Alessio Di Mauro, Giorgio Galimberti and Federico Luzzi -- in 2007-08 for terms ranging from six weeks to nine months for betting. Banned for life for match fixing were Daniel Koellerer of Austria in 2011, David Savic of Serbia in 2012 and Andrey Kumantsov of Russia last year. In addition, one man was charged and five others arrested last year in an Australian police operation against an international match-fixing syndicate, the AP reported. Even while Maria Sanchez struggled in singles last year, she remained in the top 100 in doubles. The 25-year-old Modesto product and USC graduate dropped from No. 94 to No. 106 this week after losing in the first round of the $100,000 Midland (Mich.) Challenger with countrywoman Asia Muhammad. Sanchez and Sharon Fichman of Canada gained last year's final in Midland, losing to fourth-seeded Anna Tatishvili of the United States and Heather Watson of Great Britain 7-5, 5-7 [10-6]. Sanchez, 5-foot-10 (1.78 meters), went on to reach a career-high No. 79 in doubles last November. After ending 2014 by advancing to four straight doubles finals in $50,000 tournaments, winning two, Sanchez has yet to win a doubles match this year. She opened 2015 by losing in the first round at Auckland on the WTA tour as the defending champion with Fichman, followed by three Challenger losses. Ranked a career-high No. 107 in singles in July 2013, Sanchez has tumbled to No. 224. Collin Altamirano, 19-year-old Sacramentan -- No. 749 in singles (+1), No. 886 in doubles (-2). Bradley Klahn, 24-year-old former Stanford star -- No. 204 in singles (+17), No. 138 in doubles (-2). Scott Lipsky, 33-year-old former Stanford star -- No. 33 in doubles (-1), unranked in singles. Mackenzie McDonald, 19-year-old Piedmont resident -- No. 631 in singles (+3), No. 559 in doubles (-4). Dennis Novikov, 21-year-old San Jose resident -- No. 271 in singles (-1), career-high No. 293 in doubles (no change). Sam Querrey, 27-year-old San Francisco native and former Sacramento Capital in World TeamTennis (2012-13) -- No. 39 in singles (+2), No. 64 in doubles (-1). Matt Seeberger, 30-year-old Los Altos resident -- No. 394 in doubles (+2). Dmitry Tursunov, 32-year-old resident of Folsom in Sacramento area -- No. 140 in singles (-2), No. 241 in doubles (+1). Kristie Ahn, 22-year-old former Stanford star -- No. 542 in singles (no change), No. 608 in doubles (-6). CiCi Bellis, 15-year-old resident of Atherton in San Francisco Bay Area -- Career-high No. 244 in singles (no change), No. 817 in doubles (-3). Alexandra Facey, 22-year-old resident of Cameron Park in Sacramento area -- No. 727 in doubles (-2). Kat Facey, 22-year-old resident of Cameron Park in Sacramento area -- No. 727 in doubles (-2). Nicole Gibbs, 21-year-old former Stanford star -- Career-high No. 86 in singles (+1), No. 996 in doubles (-2). Michaela Gordon, 15-year-old resident of Saratoga in San Francisco Bay Area -- No. 683 in singles (-1). Lejla Hodzic, 29-year-old former Stanford standout -- No. 744 in doubles (-4). Raquel Kops-Jones, 32-year-old San Jose resident and former Cal star -- Career-high No. 11 in doubles (no change), No. 809 in singles (+2). Maria Sanchez, 25-year-old Modesto product -- No. 106 in doubles (-12), No. 224 in singles (-1). Karina Vyrlan, 16-year-old Sacramentan -- No. 954 in singles (-2). Allie Will, 23-year-old native of San Mateo in San Francisco Bay Area -- No. 174 in doubles (-8), No. 569 in singles (-6). Carol Zhao, 19-year-old Stanford sophomore -- No. 289 in singles (-2), No. 511 in doubles (-2). Dubai (women), quarterfinals, 2-6 a.m. (live) and 7-9 p.m. (repeat). Dubai (women), Rio de Janeiro (men, women), Delray Beach (men), Marseille (men), 6:30 a.m.-7 p.m. (live). Dubai (women), Rio de Janeiro (men, women), Delray Beach (men), Marseille (men), 4:30 a.m.-1:30 p.m. (live). Rio de Janeiro (men), quarterfinals, 1:30-5 p.m. (live). Dubai (women), Rio de Janeiro (men, women), Delray Beach (men), Marseille (men), 6:30 a.m.-3 p.m. (live). Delray Beach (men), semifinals, 3-7 p.m. (repeat/live). Dubai (women), final, 7-9 p.m. (repeat). Dubai (women), final, 7-9 a.m. (repeat). Rio de Janeiro (men, women), Delray Beach (men), Marseille (men), 9 a.m.-3 p.m. (live). Delray Beach (men), doubles and singles finals, 3:30-7 p.m. (repeat). Rio de Janeiro (men), final, 7-9 p.m. (repeat). In news about as surprising as the New York Knicks losing, the Oklahoma men climbed to No. 1 in the latest college rankings released today. The Sooners (10-0) defeated the Trojans (9-1) on Monday in frigid Chicago to win their first title in the ITA National Indoor Championship. It was a rematch of last year's NCAA final, won by USC. Oklahoma and USC flip-flopped at the top two spots in the rankings. John Roddick, Andy's older brother, is in his sixth season as the Sooners' coach. Cal (7-2) dropped one notch to No. 14 after losing in the opening round of 16 in the National Indoors to host and No. 5 Illinois, then falling to No. 15 Columbia and beating No. 22 Penn State in the consolations. The top 10 women's teams, including No. 5 Cal and No. 10 Stanford, remained the same. Avenging its loss to USC in last year's NCAA final, No. 2 Oklahoma defeated the No. 1 Trojans 4-2 today in Chicago for its first title in the ITA National Men's Team Indoor Championship. No. 63 Alex Ghilea provided the clincher, beating Max de Vroome 6-3, 4-6, 6-3 on Court 5. De Vroome gave USC a 4-2 victory in the NCAA final by outlasting Andrew Harris 4-6, 6-3, 6-4 on Court 4. Harris won the 2012 Wimbledon and French Open junior boys doubles title with fellow Australian Nick Kyrgios, who has soared to 37th in the men's world rankings at 19 years old. Harris now plays No. 1 singles as a sophomore. USC's Connor Farren, a sophomore from Foster City in the San Francisco Bay Area, lost at No. 3 doubles with Nick Crystal. Farren did not play singles. John Roddick, Andy's older brother, is in his sixth season as Oklahoma's coach. 1. No. 5 Axel Alvarez and Dane Webb (Oklahoma) def. No. 1 Yannick Hanfmann and Roberto Quiroz, 7-6 (4). 2. No. 38 Max de Vroome and Eric Johnson (USC) def. Andrew Harris and Spencer Papa, 6-1. 3. Jose Salazar and Alex Ghilea (Oklahoma) def. Nick Crystal and Connor Farren, 7-5. 1. No. 7 Yannick Hanfmann (USC) vs. No. 26 Andrew Harris, 4-6, 6-4, 4-4, did not finish. 2. No. 11 Axel Alvarez (Oklahoma) def. No. 24 Roberto Quiroz, 7-6 (3), 6-2. 3. No. 31 Dane Webb (Oklahoma) def. No. 20 Jonny Wang, 6-0, 6-4. 4. Eric Johnson (USC) def. Spencer Papa, 6-4, 6-1. 5. No. 63 Alex Ghilea (Oklahoma) def. Max de Vroome, 6-3, 4-6, 6-3. 6. No. 49 Nick Crystal (USC) def. Jose Salazar, 7-5, 4-6, 6-2. The ITA National Men's Team Indoor Championships has its dream final. Top-ranked USC, with Connor Farren from the San Francisco Bay Area, will face No. 2 Oklahoma today in a rematch of last year's NCAA final. The Trojans won 4-2 for their fifth title in six years. On Sunday in Chicago, USC (9-0) outclassed No. 4 Georgia 4-1, and Oklahoma (9-0) topped No. 10 Baylor 4-2. Farren, a sophomore from Foster City, lost at No. 3 doubles (with Nick Crystal) in his only action. No. 63 Alex Ghilea clinched the match for Oklahoma, winning the last 11 games in a 4-6, 7-5, 6-0 decision over Mate Zsiga at No. 5. Meanwhile, No. 3 Virginia and No. 13 Cal completed play with consolation victories. The Cavaliers (7-1), featuring freshman Collin Altamirano of Sacramento, routed No. 7 North Carolina 4-0. The Bears (7-2), with freshmen Billy Griffith of Fresno and JT Nishimura of San Jose, defeated No. 22 Penn State 4-2. Altamirano won at No. 4 singles and No. 3 doubles. Griffith lost at No. 3 singles, but Nishimura triumphed at No. 4. Neither played doubles. 1. Austin Smith and Ben Wagland (Georgia) def. No. 1 Yannick Hanfmann and Roberto Quiroz, 6-4. 2. No. 38 Max de Vroome and Eric Johnson (USC) vs. Nathan Pasha and Eric Diaz, 5-5, suspended. 3. Paul Ooosterbaan and Wayne Montgomery (Georgia) def. Nick Crystal and Connor Farren, 6-1. Order of finish: 3, 1. 1. No. 17 Wayne Montgomery (Georgia) vs. No. 7 Yannick Hanfmann, 6-4, 3-6, 4-1, suspended. 2. No. 24 Roberto Quiroz (USC) def. No. 21 Austin Smith, 7-6 (2), 6-3. 3. No. 15 Nathan Pasha (Georgia) vs. No. 20 Jonny Wang, 3-6, 6-2, 3-3, suspended. 4. Eric Johnson (USC) def. Nick Wood, 6-1, 6-1. 5. Max de Vroome (USC) def. Ben Wagland, 7-5, 6-1. 6. No. 49 Nick Crystal (USC) def. Paul Oosterbaan, 6-2, 6-3. Order of finish: 4, 6, 5, 2. Here's how loaded the University of Virginia men are: Top-ranked Thai-Son Kwiatkowski played No. 3 singles against Baylor on Saturday. And Collin Altamirano, a freshman from Sacramento who won the USTA 18 national title in 2013 and reached last year's final, played No. 4. Still, the third-ranked Cavaliers lost to No. 11 Baylor 4-3 in the quarterfinals of the ITA National Team Indoor Championship in Chicago. The Bears will take on No. 2 Oklahoma today, and No. 1 USC will meet No. 4 Georgia in the other semifinal. Virginia (6-1) will face No. 7 North Carolina in a consolation match. No. 13 Cal (6-2), which lost to No. 15 Columbia 4-3 in a consolation quarterfinal, will play No. 22 Penn State. Altamirano overwhelmed Diego Galeano 6-1, 6-2 but lost at No. 3 doubles with Mitchell Frank, 6-3. Kwiatkowski fell to No. 27 Tony Lupieri 6-4, 7-6 (10). Mate Zsiga gave Baylor the victory by defeating Alexander Ritschard 6-4, 3-6, 6-3 at No. 5. No. 10 Julian Lenz of Baylor humbled Frank, unranked only because he has been playing in professional instead of college tournaments, 6-2, 6-0 at No. 1. Frank won two Futures tournaments last summer, beating former world No. 1 junior Yuki Bhambri for the title in Edwardsville, Ill. Bhambri was ranked No. 152 among the world's men at the time. In 2013, Frank clinched Virginia's only NCAA team title in men's tennis with a 0-6, 7-5, 6-4 win over UCLA's Adrien Puget at No. 3, saving a championship point. 1. No. 37 Luca Corinteli and Ryan Shane (Virginia) vs. No. 40 Mate Zsiga and Tony Lupieri, 6-6, did not finish. 2. Julian Lenz and Diego Galeano (Baylor) def. No. 41 Thai-Son Kwiatkowski and Mac Styslinger, 7-6 (2). 3. Vince Schneider and Felipe Rios (Baylor) def. Collin Altamirano and Mitchell Frank, 6-3. Order of finish: 3, 2*. 1. No. 10 Julian Lenz (Baylor) def. Mitchell Frank, 6-2, 6-0. 2. No. 4 Ryan Shane (Virginia) def. No. 67 Max Tchoutakian, 4-6, 6-1, 6-1. 3. No. 27 Tony Lupieri (Baylor) def. No. 1 Thai-Son Kwiatkowski, 6-4, 7-6 (10). 4. Collin Altamirano (Virginia) def. Diego Galeano, 6-1, 6-2. 5. Mate Zsiga (Baylor) def. Alexander Ritschard, 6-4, 3-6, 6-3. 6. J.C. Aragone (Virginia) def. Vince Schneider, 6-3, 6-4. Order of finish: 1, 4, 6, 2, 3, 5**. The 13th-ranked Cal men lost to No. 5 Illinois 4-0 on Friday in the first round of the ITA National Men's Team Indoor Championship in Chicago. The University of Illinois is a two-hour drive south from Chicago. Cal freshmen Billy Griffith of Fresno and J.T. Nishimura of San Jose lost in straight sets at No. 3 and No. 4 singles, respectively. The Bears (6-1) will play Columbia in the consolation bracket today at 4:30 p.m. PST. Meanwhile, No. 3 Virginia routed No. 17 Texas Christian 4-0. Cavaliers freshman Collin Altamirano of Sacramento won at No. 3 doubles with Mitchell Frank but did not play singles. Virginia (6-0) will meet No. 10 Baylor (5-1) today in the quarterfinals. The Bears upset No. 6 Duke 4-1. 1. No. 11 Tim Kopinski and Ross Guignon (Illinois) def. No. 30 Gregory Bayane and Chase Melton, 6-3. 2. Jared Hiltzik and Farris Goesa (Illinois) def. No. 32 Andre Goransson and Oskar Wikberg, 7-6 (3). 3. Filip Bergevi and Mads Engsted (Cal) def. Blaker Bazarnik and Brian Page, 6-3. Order of finish: 3, 1, 2*. 1. No. 41 Farris Gosea (Illinois) vs. No. 42 Andre Goransson, abandoned. 2. No. 23 Jared Hiltzik (Illinois) vs. No. 114 Filip Bergevi, abandoned. 3. No. 37 Tim Kopinski (Illinois) def. Billy Griffith, 6-3, 6-4. 4. No. 69 Aron Hiltzik (Illinois) def. J.T. Nishimura, 7-5, 6-1. 5. No. 46 Aleks Vukic (Illinois) def. Oskar Wikberg, 6-1, 6-4. 6. Toshiki Matsuya (Illinois) vs. Gregory Bayane, abandoned. Order of finish: 5, 3, 4**. Top seeds Novak Djokovic and Serena Williams won the Australian Open, but there was still plenty of drama and intrigue during the two weeks ... er, fortnight. over 11th-seeded Ernests Gulbis in the opening round. Best Matches -- Both occurred on Day 1, although there were many gems later. Thanasi Kokkinakis, an 18-year-old wild card from Australia, saved four match points in the fourth set of a 5-7, 6-0, 1-6, 7-6 (2), 8-6 victory over 11th-seeded Ernests Gulbis of Latvia in front of a raucous crowd at night on Show Court 3. The 6-foot-5 (1.96-meter) Kokkinakis, ranked No. 147, needed 4 hours, 7 minutes to subdue Gulbis, a French Open semifinalist last year. Christina McHale of Englewood Cliffs, N.J., vomited on Court 15 and saved a match point in a 6-4, 1-6, 12-10 win over qualifier Stephanie ("Can't See The") Foretz of France. The third set lasted 1 hour, 51 minutes, and the match went 3 hours, 9 minutes. Biggest Upset -- Andreas Seppi of Italy shocked second-seeded Roger Federer, who has won a record 17 Grand Slam singles titles, 6-4, 7-6 (5), 4-6, 7-6 (5) in the third round. Federer had reached the semifinals or better in the Australian Open for 11 straight years and had never lost to Seppi in 10 matches. Biggest Comebacks -- Nick Kyrgios, a 19-year-old Australian, outlasted Seppi 5-7, 4-6, 6-3, 7-6 (5), 8-6 in 3 hours, 34 minutes in the fourth round. Kyrgios survived a match point with a service winner at 5-6 in the fourth set of the night match in front of a boisterous capacity crowd of 10,500 at Hisense Arena. Maria Sharapova saved two match points in a 6-1, 4-6, 7-5 second-round victory over fellow Russian Alexandra Panova, a qualifier ranked No. 150. Sharapova, the runner-up to Victoria Azarenka in the 2010 Bank of the West Classic at Stanford, trailed by two service breaks at 4-1 in the third set. The night of the Sharapova match, Rafael Nadal overcame stomach cramps and dizziness to outlast qualifier Tim Smyczek of Tampa, Fla., 6-2, 3-6, 6-7 (2), 6-3, 7-5 in 4 hours, 12 minutes. Nadal missed almost three months after Wimbledon last year with a right wrist injury and had an appendectomy in November. Breakout Performer -- Madison Keys, a 19-year-old American, outslugged fourth seed and reigning Wimbledon champion Petra Kvitova in the third round en route to her first Grand Slam semifinal. In the semis, Keys saved eighth match points before succumbing to Williams 7-6 (5), 6-2. Biggest Flop -- Former world No. 1 Ana Ivanovic, seeded fifth, lost to Czech qualifier Lucie Hradecka 1-6, 6-3, 6-2 in the first round. Ivanovic finished in the top five last year for the first time since 2008. Biggest Collapse -- Andy Murray, who won his first career ATP World Tour title in San Jose in 2006 and repeated the following year, lost the last nine games of his 7-6 (5), 6-7 (4), 6-3, 6-0 loss to Novak Djokovic in the final. The first two sets lasted 2 hours, 32 minutes, and the last two took only 1 hour, 8 minutes. Linda Ronstadt "Poor, Poor Pitiful Me" Award -- Murray fell to 0-4 in Australian Open finals. Then there's Nicolas Mahut, a 33-year-old Frenchman who fell to 0-2 in Grand Slam finals, both in men's doubles. Mahut also lost the longest match in tennis history, 70-68 in the fifth set, to John Isner in the first round at Wimbledon in 2010. Winston Churchill Award (best speeches) -- Sharapova and Murray displayed admirable attitudes in their runner-up speeches. Sharapova was philosophical and Murray resolute. Sharapova, the 2008 Australian Open champion and a three-time runner-up in Melbourne: "I've had some of the best memories of my career on this court and also some of the toughest losses, but that's the life of a tennis player." Murray, who underwent "minor" back surgery in September 2013: " ... I'd also like to thank my team. We put in a lot of hard work to try and get back in this position after what was a difficult year last year and unfortunately couldn't quite do it tonight. But I'm a little bit closer than I was a few months ago, and I'll keep working hard to get there." Most Spectacular Stroke -- Stan Wawrinka's sensational one-handed backhand. Best Shot -- "Tweeners" are one thing, but when was the last time you saw a behind-the-back volley? India's Leander Paes, a 41-year-old magician with a racket, flicked one to keep a long rally alive in the first set of his mixed doubles semifinal with Martina Hingis. They won the point on Paes' next shot and went on to capture the title. with his display of sportsmanship against Rafael Nadal. Mother Teresa Award (best sportsmanship) -- With Nadal serving at 6-5, 30-0 in the fifth set against Smyczek (pronounced SMEE-check), a fan yelled something during the Spanish star's first delivery. The ball sailed way long, and Smyczek gave Nadal another first serve. Mind you, this was the biggest match of the 27-year-odl Smyczek's life. Kathy Griffin Award (most candid) -- Smyczek, on his loss to Nadal: "That was his C or D game, and he found a way to win. Hats off to him. That's why he's one of the best." John McEnroe Award (biggest meltdown) -- John Isner, seeded 19th, smashed his racket on the court not once but twice after falling behind two sets to none in his third-round match against Gilles Muller on a net-cord winner. Muller won in straight sets. Runners-up: Grigor Dimitrov and Nick Kyrgios for smashing their rackets in their fourth-round matches. Dimitrov lost to Murray, but Kyrgios beat Seppi. Liberace Award (flashiest appearance) -- Against Seppi, Kyrgios sported neon yellow shoes, a neon yellow and magenta shirt, black shorts and socks, a mini-Mohawk haircut with a "Z" cut in one side and two notches in an eyebrow, a giant earring and a gaudy necklace. By the way, what was it with all these bright colors, mainly yellow, the players wore? You can see these guys and gals from Mars. Cary Grant Award (classiest appearance) -- If Kyrgios is Gene Simmons, Milos Raonic is Lawrence Welk. The clean-cut Canadian, 24, looks as if he just stepped off the set of "American Graffiti." Frankly, that's rather refreshing. Jim Courier Award (oddest changeover ritual) -- Raonic closed his eyes, chanted something, crossed his arms and tapped his knees with his fingers. Hey, whatever works. Courier read Armistead Maupin's novel "Maybe the Moon" during changeovers in the 1993 ATP Championships. Worst On-court Interviewer -- Australian Todd Woodbridge may be an International Tennis Hall of Famer, but he can barely ask a question, much less a decent one. After Kygrios beat Seppi, Woodbridge just said, "Wow," and shoved the microphone in the winner's face. Woodbridge later instructed Kyrgios, "Take us through the match." Hey, Todd, would you ask a question please? Friendly suggestion: "How did you come back from two sets to none down?" Dumbest Question -- Pam Shriver, another Hall of Famer, is a good analyst. But her interview with McHale after the Foretz match was not one of her finer moments. Shriver actually asked McHale: "How does it feel to join Pete Sampras as a player to throw up on the court and win a Grand Slam match?" John Kerry Award (most diplomatic answer) -- McHale could have been forgiven for responding sarcastically to Shiver, "How do you think it felt? I always enjoy tossing my cookies in front of a crowd." Instead, McHale said matter of factly, "I would have preferred not to have thrown up on the court." Most Tiresome Commercial -- Take a wild guess. Hint: "Like a laneway leading to another world ... " First of all, what's a laneway? Is that Australian for "freeway"? Secondly, lord have mercy. Did we have to hear that Melbourne jingle every five minutes? For the second year in a row? Can we please retire this thing before we all lose what little is left of our sanity? Bradley Klahn, a 24-year-old Stanford graduate, tumbled 54 places to No. 221 in this week's world rankings. Klahn lost in the first round of last week's $50,000 Challenger in Burnie, Australia, after winning the $50,000 Challenger in Adelaide, Australia, during the same week last year. The 6-foot (1.83-meter) left-hander from the San Diego suburb of Poway climbed to a career-high No. 63 last March before battling injuries. Klahn reached the second round of the U.S. Open in 2012, beating then-No. 36 Jurgen Melzer of Austria in five sets as a qualifier, and 2013. Collin Altamirano, 19-year-old Sacramentan -- No. 750 in singles (-3), No. 884 in doubles (no change). Bradley Klahn, 24-year-old former Stanford star -- No. 221 in singles (-54), No. 136 in doubles (-1). Scott Lipsky, 33-year-old former Stanford star -- No. 32 in doubles (+1), unranked in singles. Mackenzie McDonald, 19-year-old Piedmont resident -- No. 634 in singles (no change), No. 555 in doubles (+5). Dennis Novikov, 21-year-old San Jose resident -- Career-high No. 270 in singles (+1), career-high No. 293 in doubles (+24). Sam Querrey, 27-year-old San Francisco native and former Sacramento Capital in World TeamTennis (2012-13) -- No. 41 in singles (+1), No. 63 in doubles (+1). Matt Seeberger, 30-year-old Los Altos resident -- No. 396 in doubles (-6). Dmitry Tursunov, 32-year-old resident of Folsom in Sacramento area -- No. 138 in singles (-1), No. 242 in doubles (+1). Kristie Ahn, 22-year-old former Stanford star -- No. 542 in singles (+17), No. 602 in doubles (+92). CiCi Bellis, 15-year-old resident of Atherton in San Francisco Bay Area -- Career-high No. 244 in singles (+4), No. 814 in doubles (-4). Hadley Berg, 18-year-old resident of Greenbrae in San Francisco Bay Area -- No. 934 in doubles (-3). Alexandra Facey, 21-year-old resident of Cameron Park in Sacramento area -- No. 725 in doubles (-6). Kat Facey, 21-year-old resident of Cameron Park in Sacramento area -- No. 725 in doubles (-6). Nicole Gibbs, 21-year-old former Stanford star -- Career-high No. 87 in singles (no change), No. 994 in doubles (-3). Michaela Gordon, 15-year-old resident of Saratoga in San Francisco Bay Area -- Career-high No. 682 in singles (no change). Lejla Hodzic, 29-year-old former Stanford standout -- No. 740 in doubles (-14). Raquel Kops-Jones, 32-year-old San Jose resident and former Cal star -- Career-high No. 11 in doubles (no change), No. 811 in singles (-2). Maria Sanchez, 25-year-old Modesto product -- No. 94 in doubles (+5), No. 227 in singles (+8). Karina Vyrlan, 16-year-old Sacramentan -- No. 952 in singles (-2). Allie Will, 23-year-old native of San Mateo in San Francisco Bay Area -- No. 166 in doubles (no change), No. 563 in singles (-2). Carol Zhao, 19-year-old Stanford sophomore -- No. 287 in singles (+2), No. 509 in doubles (-3). Rotterdam (men), early rounds, 2-7 a.m. (live) and 7-10:30 a.m. (repeat). Rotterdam (men), early rounds, 10:30 a.m.-2:30 p.m. (live) and 2:30-7 p.m. (repeat). Antwerp (women), early rounds, 7-10 p.m. (delay). Rotterdam (men), quarterfinals, 3:30-7 a.m. (live). Memphis (men), quarterfinals, 5-9 p.m. (live). Memphis (men), quarterfinal, 9-11 p.m. (repeat). Memphis (men), semifinals, 3-7 p.m. (live). Rotterdam (men), semifinals, 7-9 p.m. (delay). Antwerp (women), final, 10-11:30 a.m. (delay) and 7-9 p.m. (repeat). Sao Paulo (men), final, 11:30 a.m.-1 p.m. (delay). Memphis (men), final, 1-3 p.m. (live) and 9-11 p.m. (repeat). Rotterdam (men), final, 5-7 p.m. (delay). Maegan Manasse of the Cal women jumped to No. 1, and Piedmont resident Mackenzie McDonald of the UCLA men rose to No. 2 in the latest national collegiate rankings released today. Manasse (28-3), a sophomore from Redondo Beach in the Los Angeles area, had been ranked No. 5. She became Cal's first top-ranked singles player since Zsofi Susanyi tied for No. 1 on Feb. 12, 2013, according to calbears.com. The Bears' Jana Juricova, the 2011 NCAA singles champion, also reached No. 1. All of Cal's six singles players are ranked. In addition to Manasse, Susanyi, a senior, is 20th; junior Lynn Chi, last year's NCAA runner-up to Virginia's Danielle Collins, is 26th; freshman Karla Popovic is 28th; junior Klara Fabikova is 34th; and sophomore Denise Starr is 59th. Cal remained fifth in the team rankings after advancing to the semifinals of the ITA National Women's Team Indoor Championship in Charlottesville, Va.
McDonald (19-3), a sophomore, had been ranked No. 7. Virginia's Thai-Son Kwiatkowski, a sophomore from Charlotte, N.C., improved from No. 4 to No. 1. The North Carolina women won their second ITA National Team Indoor Championship in three years on Monday, overwhelming Georgia 4-1 on Monday in Charlottesville, Va. In the clinching match, 22nd-ranked Caroline Price outlasted Kennedy Shaffer 6-1, 2-6, 7-5 at No. 3 singles. In last year's NCAA team final, Price lost the clinching match at No. 3 singles in the Tar Heels' 4-3 loss to UCLA. At No. 1 singles on Monday, eighth-ranked Jamie Loeb of North Carolina led No. 19 Lauren Herring 6-2, 5-7, 3-1 when Price clinched. 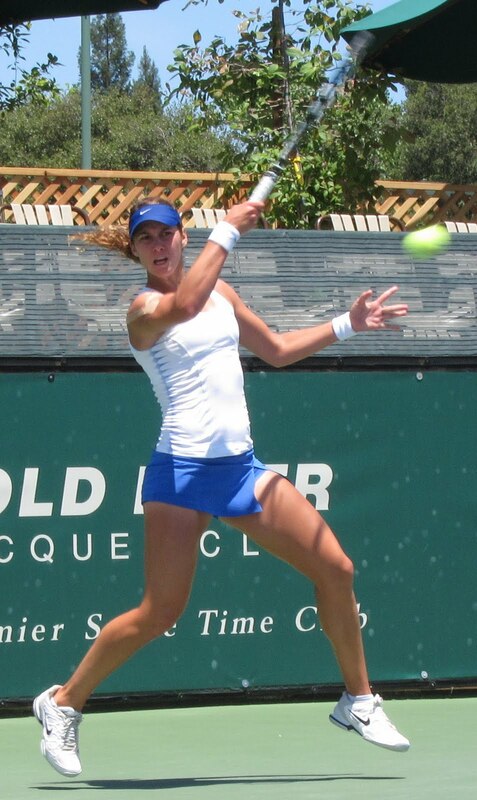 Loeb, a sophomore from Ossining, N.Y., who trains at the Manhattan-based John McEnroe Tennis Academy, reached the quarterfinals of the Sacramento Challenger last July. She upset second-seeded An-Sophie Mestach, a Belgian ranked No. 146 in the world at the time, 6-1, 6-2 in the second round. North Carolina (9-0) is ranked third nationally, and Georgia (6-3) is ninth. The Bulldogs defeated No. 5 Cal 4-2 in the Indoor semifinals. 1. No. 13 Ashley Dai and Kate Vialle (NC) vs. Lauren Herring and Ellen Perez, 4-4, unfinished. 2. Jamie Loeb and Caroline Price (NC) def. Silvia Garcia and Kennedy Shaffer, 6-2. 3. Hayley Carter and Whitney Kay (NC) def. Caroline Brinson and Hannah King (Georgia), 6-2. 1. No. 8 Jamie Loeb (NC) vs. No. 19 Lauren Herring, 6-2, 5-7, 3-1, unfinished. 2. No. 31 Hayley Carter (NC) def. Ellen Perez, 6-3, 6-4. 3. No. 22 Caroline Price (NC) def. Kennedy Shaffer, 6-1, 2-6, 7-5. 4. Whitney Kay (NC) def. No. 83 Silvia Garcia, 6-4, 6-3. 5. No. 91 Hannah King (Georgia) vs. Ashley Dai, 6-4, 4-6, 5-2, unfinished. 6. Caroline Brinson (Georgia) def. Kate Vialle, 6-3, 4-6, 6-1. Order of finish: 2, 4, 6, 3. Ninth-ranked Georgia defeated No. 5 Cal 4-2 on Sunday in the semifinals of the ITA National Women's Team Indoor Championship in Charlottesville, Va.
Hannah King won the deciding match at No. 5 singles, beating 30th-ranked Karla Popovic 7-5, 6-3 as Call fell to 4-1 this season. Georgia (6-2) will play No. 3 North Carolina (8-0) today for the title. The Tar Heels routed No. 2 Florida 4-0. 1. No. 4 Maegan Manasse and Denise Starr (Cal) def. Lauren Herring and Ellen Perez, 6-3. 2. Silvia Garcia and Kennedy Shaffer (Georgia) def. No. 9 Klara Fabikova and Zsofi Susanyi, 6-3. 3. Caroline Brinson and Hannah King (Georgia) def. Stephane Lin and Karla Popovic, 6-1. 1. No. 5 Maegan Manasse (Cal) vs. No. 19 Lauren Herring, abandoned. 2. No. 78 Klara Fabikova (Cal) def. Ellen Perez, 6-2, 6-2. 3. Kennedy Shaffer (Georgia) def. No. 14 Zsofi Susanyi, 6-3, 6-4. 4. No. 64 Denise Starr (Cal) def. Silvia Garcia, 6-3, 7-5. 5. Hannah King (Georgia) def. No. 30 Karla Popovic, 7-5, 6-3. 6. Caroline Brinson (Georgia) def. Cecilia Estlander, 6-2, 6-4. Order of finish: 2, 3, 6, 4, 5*. The fifth-ranked Cal women defeated No. 20 Texas Christian 4-1 on Saturday to reach the semifinals of the ITA National Women's Indoor Championship in Charlottesville, Va.
Zsofi Susanyi, a senior from Hungary, clinched the match with a 6-3, 6-4 victory over Sofiko Kadzhaya at No. 3 singles. Cal (4-0) will meet No. 9 Georgia (5-2) today at 9 a.m. PST. The Bulldogs upset top-ranked UCLA 4-2. In the other semifinal at 12:30 p.m., No. 2 Florida (5-0) will face No. 3 North Carolina (6-0). 1. No. 4 Maegan Manasse and Denise Starr (Cal) def. Stefanie Tan and Seda Arantekin, 7-5. 2. No. 9 Klara Fabikova and Zsofi Susanyi (Cal) def. Simona Parajova and Sofiko Kadzhaya, 6-4. 3. Palina Dubavets and Alexis Pereira (TCU) def. Cecilia Estlander and Karla Popovic, 6-3. 1. No. 5 Maegan Manasse (Cal) def. Stefanie Tan, 6-3, 6-3. 2. Simona Parajova (TCU) def. No. 78 Klara Fabikova, 6-3, 6-1. 3. No. 14 Zsofi Susanyi (Cal) def. Sofiko Kadzhaya, 6-3, 6-4. 4. No. 64 Denise Starr (Cal) vs. Palina Dubavets, abandoned. 5. No. 30 Karla Popovic (Cal) def. Alexis Pereira, 7-5, 6-3. 6. Cecilia Estlander (Cal) vs. Seda Arantekin, abandoned. Order of finish: 2, 1, 5, 3*. The fifth-ranked Cal women rallied from a 3-0 deficit to stun No. 11 Vanderbilt 4-3 on Friday in the opening round of 16 at the ITA National Women's Team Indoor Championship in Charlottesville, Va.
Cecilia Estlander, a senior from Finland, defeated Georgina Sellyn 1-6, 6-3, 6-1 at No. 6 singles in the deciding match. Cal (3-0) will play No. 20 TCU (4-1) today at 12:30 p.m. PST in the quarterfinals. The Horned Frogs upset fourth-ranked Duke, the defending champion, 4-3. 1. No. 32 Courtney Colton and Sydney Campbell (Vanderbilt) def. No. 4 Maegan Manasse and Denise Starr 7-6 (5). 2. No. 9 Klara Fabikova and Zsofi Susanyi (Cal) def. Ashleigh Antal and Marie Casares 6-2. 3. Frances Altick and Astra Sharma (Vanderbilt) def. Cecilia Estlander and Karla Popovic 6-0. Order of finish: 3, 2, 1*. 1. No. 5 Maegan Manasse (Cal) def. No. 15 Sydney Campbell 4-6, 6-0, 6-3. 2. No. 78 Klara Fabikova (Cal) def. Courtney Colton 6-4, 7-5. 3. No. 14 Zsofi Susanyi (Cal) def. Frances Altick 6-4, 6-3. 4. Astra Sharma (Vanderbilt) def. No. 64 Denise Starr 6-3, 7-5. 5. No. 77 Marie Casares (Vanderbilt) def. No. 30 Karla Popovic 6-4, 6-2. 6. Cecilia Estlander (Cal) def. Georgina Sellyn 1-6, 6-3, 6-1. Order of finish: 5, 4, 3, 1, 2, 6*. The BNP Paribas Open in Indian Wells has long been a glorious festival featuring numerous men's and women's Grand Slam champions, a stunning setting and spectacular weather. But from 2002 through last year, something was missing. Serena and Venus Williams boycotted the tournament after controversy erupted there in 2001. The protest, at least by Serena, will end next month. She announced today that she has accepted a wild card to play in the BNP Paribas Open, scheduled for March 9-22. "I’m fortunate to be at a point in my career where I have nothing to prove," the 33-year-old Williams, who won the Australian Open on Saturday for her 19th Grand Slam singles title, wrote in Time Magazine. "I’m still as driven as ever, but the ride is a little easier. I play for the love of the game. And it is with that love in mind, and a new understanding of the true meaning of forgiveness, that I will proudly return to Indian Wells in 2015." Venus Williams, 34, has not indicated whether she will play in Indian Wells. The BNP Paribas Open broke its attendance record for the eighth straight year in 2014, drawing an announced 431,527 fans. Most, of course, come from Southern California, but the tournament also attracts many tennis enthusiasts from Northern California and throughout the West. Serena Williams, meanwhile, has won the Bank of the West Classic at Stanford three times, including last year. Serena wrote in Time that the Indian Wells tournament "held a special place in my heart." She won her first pro match there, with Venus in doubles, in 1997 at age 15. Venus, 16 at the time, then qualified in singles and reached the quarterfinals. Serena also won her first big title at Indian Wells, beating Steffi Graf in the 1999 final. The problems began when Venus defaulted to Serena minutes before their scheduled semifinal in 2001. Some fans thought their father, Richard, had arranged the default because he didn't want his daughters to play each other.
" ... Venus jilted a stadium full of fans, left TV networks scrambling on two minutes' notice, then had a news conference to explain that tendinitis in her knee had acted up," the esteemed Bill Dwyre of the Los Angeles Times wrote in a 2007 column urging the Williams sisters to return to the tournament. "She walked in and out of that press session without a limp and treated questions about the timing of her decision with arrogance and disdain. "Two weeks later, Venus won the title in Miami. She also won Wimbledon and the U.S. Open that year." Countered Serena in Time: "Throughout my whole career, integrity has been everything to me. It is also everything and more to Venus. The false allegations that our matches were fixed hurt, cut and ripped into us deeply. The under­current of racism was painful, confusing and unfair." Two days after Venus' default, the Indian Wells crowd booed Serena throughout her final against Kim Clijsters. The vitriol nearly brought Serena to tears, but she won. "Their father, Richard, got into shouting matches with fans and told reporters that the boos had been racially motivated, not triggered by anger among fans who'd bought tickets for Venus-Serena and got doubles instead," Dwyre wrote. The incident "haunted me for a long time," Serena wrote in Time. "It haunted Venus and our family as well. But most of all, it angered and saddened my father. He dedicated his whole life to prepping us for this incredible journey, and there he had to sit and watch his daughter being taunted, sparking cold memories of his experiences growing up in the South. "(Fourteen) years and a lifetime in tennis later, things feel different. A few months ago, when Russian official Shamil Tarpischev made racist and sexist remarks about Venus and me, the WTA and USTA immediately condemned him. It reminded me how far the sport has come, and how far I’ve come too." Now all the BNP Paribas Open needs is Venus. Former Stanford All-American Kristie Ahn jumped 79 places to No. 559 in the world, according to the latest WTA rankings released Monday. The injury-prone Ahn, 22, moved up by reaching the quarterfinals of last month's $25,000 Challenger in Plantation, Fla., on clay as a qualifier before losing to eventual champion Sachia Vickery. At 16, Ahn qualified for the 2008 U.S. Open in women's singles before losing to Dinara Safina 6-3, 6-4 in the first round. Safina was ranked seventh at the time and reached No. 1 the following year. The 5-foot-5 (1.65-meter) Ahn, from Upper Saddle River, N.J., advanced to the semifinals of the $25,000 Redding Challenger as a qualifier in 2012 and the quarterfinals there last year. 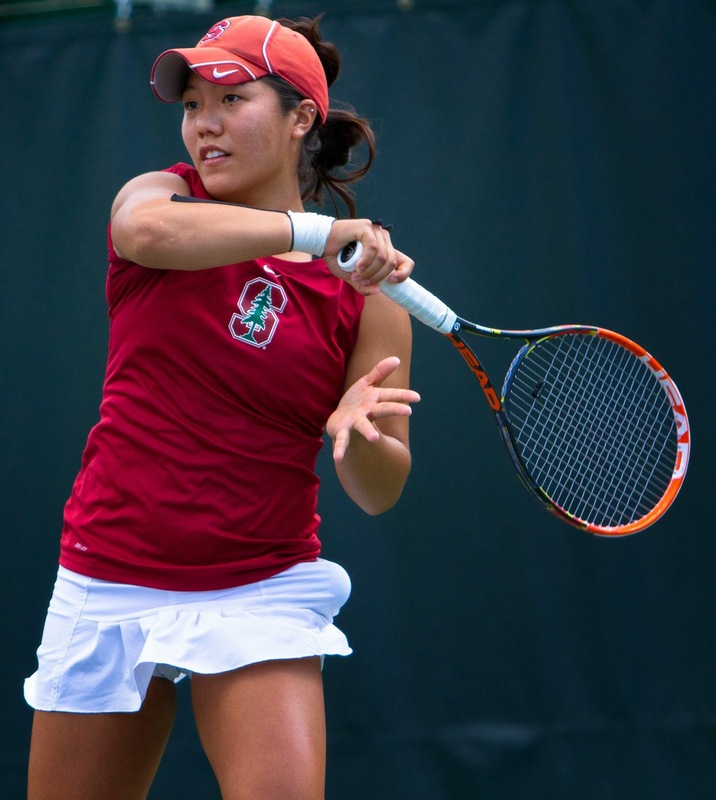 Ahn gave Stanford the 2013 NCAA team title, winning the deciding match in a 4-3 victory over Texas A&M in the final. She completed her eligibility last May after helping the Cardinal reach the NCAA semifinals and advancing to the round of 16 in singles. Collin Altamirano, 19-year-old Sacramentan -- No. 747 in singles (-1), No. 884 in doubles (-3). Bradley Klahn, 24-year-old former Stanford star -- No. 167 in singles (-17), No. 135 in doubles (no change). Mackenzie McDonald, 19-year-old Piedmont resident -- No. 634 in singles (+2), No. 560 in doubles (no change). Dennis Novikov, 21-year-old San Jose resident -- Career-high No. 271 in singles (+19), career-high No. 317 in doubles (+53). Sam Querrey, 27-year-old San Francisco native and former Sacramento Capital in World TeamTennis (2012-13) -- No. 42 in singles (-7), No. 64 in doubles (-2). Matt Seeberger, 30-year-old Los Altos resident -- Career-high No. 390 in doubles (+8). Dmitry Tursunov, 32-year-old resident of Folsom in Sacramento area -- No. 137 in singles (-8), No. 243 in doubles (-45). Kristie Ahn, 22-year-old former Stanford star -- No. 559 in singles (+79), No. 699 in doubles (+1). CiCi Bellis, 15-year-old resident of Atherton in San Francisco Bay Area -- Career-high No. 248 in singles (+3), career-high No. 810 in doubles (+3). Hadley Berg, 18-year-old resident of Greenbrae in San Francisco Bay Area -- Career-high No. 931 in doubles (+3). Alexandra Facey, 21-year-old resident of Cameron Park in Sacramento area -- Career-high No. 719 in doubles (+8). Kat Facey, 21-year-old resident of Cameron Park in Sacramento area -- Career-high No. 719 in doubles (+8). Nicole Gibbs, 21-year-old former Stanford star -- Career-high No. 87 in singles (+9), No. 991 in doubles (-168). Michaela Gordon, 15-year-old resident of Saratoga in San Francisco Bay Area -- Career-high No. 682 in singles (+13). Lejla Hodzic, 28-year-old former Stanford standout -- Career-high No. 726 in doubles (+7). Raquel Kops-Jones, 32-year-old San Jose resident and former Cal star -- Career-high No. 11 in doubles (+1), No. 809 in singles (no change). Karina Vyrlan, 16-year-old Sacramentan -- No. 950 in singles (+7). Allie Will, 23-year-old native of San Mateo in San Francisco Bay Area -- No. 166 in doubles (-6), No. 561 in singles (-30). Carol Zhao, 19-year-old Stanford sophomore -- No. 289 in singles (+4), No. 506 in doubles (+4). Montpellier (men), early rounds, 10 a.m.-12:30 p.m. and 9 p.m.-midnight (delay). Zagreb (men), early rounds, 1-5 p.m. (delay). Zagreb (men), early rounds, 3-7 a.m. and 1-5 p.m. (delay). Montpellier (men), early rounds, 11 a.m.-1 p.m. (delay). Zagreb (men), early rounds, 3-7 a.m. (delay). Montpellier (men), early rounds, 10 a.m.-1 p.m. (delay). Zagreb (men), quarterfinals, 1-5 p.m. (delay). Montpellier (men), quarterfinals, 9 p.m.-midnight (delay). Fed Cup, first round, Russia at Poland, 3-5:30 a.m. (live), 11 a.m.-3 p.m. (repeat). and 9 p.m.-midnight (repeat). Fed Cup, World Group II, United States at Argentina, 5-9 p.m. (delay). Fed Cup, first round, Russia at Poland, 3-5:30 a.m. (live) and noon-5 p.m. (delay).